Bill Weld has always felt like he could “start Monday” as president of the United States, but he never thought it was truly necessary to turn the fantasy into a reality. That is until Donald Trump came along. Weld intends to make a final decision in April on whether to launch a campaign, and, if he chooses to move forward, he will “run as hard as I can.” After all, he’s not afraid of a schoolyard bully like Trump, he said. While he may not be a nationally recognized politician, Weld is a steady figure in the GOP establishment. He began his decades-long career in conservative politics serving as a U.S. attorney for Massachusetts during the Ronald Reagan administration, and he worked his way up to lead the criminal division at the Department of Justice. He then spent six years as governor of Massachusetts, where he built a reputation for being fiscally conservative and socially liberal. In 2016, Weld was the Libertarian Party’s nominee for vice president, sharing the ticket with Gary Johnson. Still, he undeniably faces an uphill battle against a party that is hooked on Trump. According to Gallup, the president has earned a 90 percent approval rating among Republicans since mid-February. In fact, since taking office in January 2017, Trump has rarely fallen below 80 percent approval among his conservative base. But Weld takes a certain amount of pride in being starkly different from the president. He supports action on climate change, extending employment-based immigration visas, and global trade pacts like the Trans-Pacific Partnership (an agreement Trump quickly abandoned in 2017). 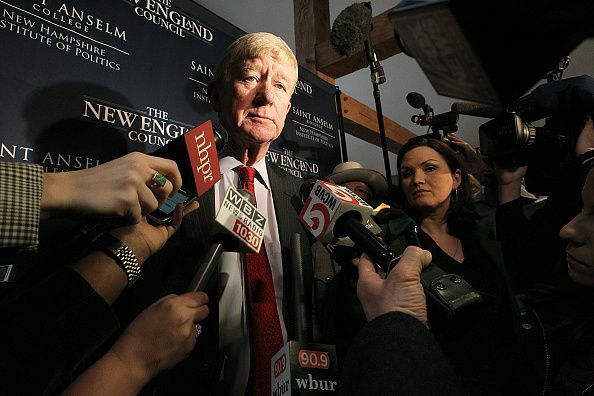 Speaking before the release of a summary of special counsel Robert Mueller’s report, which found no collusion between Russia and the president’s campaign, Weld said he was confident that Trump would continue to face legal troubles that may cloud his ability to run a re-election campaign. Weld spoke to Newsweek about his possible 2020 run, his thoughts on Trump and what he would do differently if elected president. When did you first start thinking about challenging Donald Trump in a Republican primary? We know a lot more about how Donald Trump would act in office now than we did two years ago. I wouldn’t have had this idea the day after the election. Most of all, it’s a degree of spleen being displayed in the White House. He just can’t get enough of demonizing people and attacking people, even individuals. I am one of those people who thinks the essence of democracy is that the individual shall not be thrust in a corner. Well, that’s always his first reaction, to thrust the individual in a corner. What are Trump’s biggest vulnerabilities among his Republican base that you believe you can capitalize on? The sounds that were dog whistles during the campaign, now they’re bullhorns. He really does act like a bully, and bullies are generally insecure. I think he’s insecure. I said during the ’16 campaign that I had questions about whether he was sufficiently stable to be the chief executive officer of the United States, and I haven’t seen anything to make me see fit to change that opinion. You served as the head of the criminal division at the Justice Department in the Reagan administration. How do you feel about Robert Mueller’s handling of the Russia investigation, and what do you make of the president’s attacks on his own agency? As governor, you supported environmental regulations and gun control. Do you plan on making those policies a focus of your platform? The president’s claim that climate change is a hoax is ludicrous. The science is not really debatable. If I won the job, I would put us back in the Paris [climate] accords immediately and cause the country to adopt 2050 CO2 standards that are consonant with what other industrialized countries have done. I think the president just doesn’t understand that our mountains and streams and rivers and valleys, they are our cathedrals. We don’t have the historical monuments that Europe has, but we have natural monuments, and we better damn well take care of them or they’re going to disappear. In the 1990s, you nearly became the U.S. ambassador to Mexico. Do you agree with Trump’s calls for a border wall and his stance on immigration? No, absolutely not. Almost any state governor will tell you that without in-migration of a workforce through Mexico…we can’t populate the agriculture industry or the construction industry in the western part of the United States. I think what we need is a more robust guest-worker program, such as [the one] Canada has. People come in, they work for a few months, and they go back to deal with their families. Mr. Trump and others who are anti-immigrant—in fact, anti-foreigner all along the line—they have made up this straw man, this boogeyman of “Oh, 11 million illegal aliens demanding immediate citizenship.” Most of those people don’t want to be citizens; they just overstayed their visa because we kick them out too quick. We need to extend those work visas. These ideas seem almost progressive in conservative politics today. Do you think the Republican Party has gone off the rails during the Trump presidency? Yes, I sure do. It doesn’t look like the party of Lincoln. You know, I like to think that I belong to the party of Lincoln and the party of Teddy Roosevelt and the party of Ronald Reagan and the party of Dwight Eisenhower. That’s the party I registered for when I was 18 years old. Another thing that is going to sound progressive, but really isn’t, is that I think we should have as many people as possible vote in this country. I think we need a new means of voting, and we should take a good look at mobile voting—don’t laugh, it means you can vote on your cellphone. You’d have to put in adequate security measures, like a copy of your passport or driver’s license on file. Whatever security guarantees are necessary. I don’t really see an argument against having many more people vote. I don’t think that if people are too discouraged to vote that that’s a good thing. And I’m afraid a lot of people are too discouraged or disgusted to vote. Not good for the Republican Party, not good for the polity. Would you support getting rid of the Electoral College? If Trump were to win the Republican Party’s nomination, would you encourage Americans to vote Democrat during the general election? Well, I would not endorse Mr. Trump, let’s put it that way. What further damage do you think Trump can do if elected for another four years? I think he’s not really in favor of democracy, he’s in favor of autocracy. He’s expressed admiration for President Kim [Jong Un] of North Korea because “what a strong kid he is, he killed his uncle, he killed his brother, that’s strength.” [Rodrigo] Duterte in the Philippines personally kills people suspected of trafficking in narcotics; he holds the gun and shoots them. [Vladimir] Putin in Russia, whatever else you may think of him, he’s certainly an autocrat—and I think most Americans probably don’t think a lot of good things about him, but I know one who does and that’s Donald Trump, who just melts when he’s around Putin. Andy McCabe, the guy who was number two at the FBI, he kind of had it right when he said that Mr. Trump may not be a Russian asset, meaning an agent, but he might as well be.